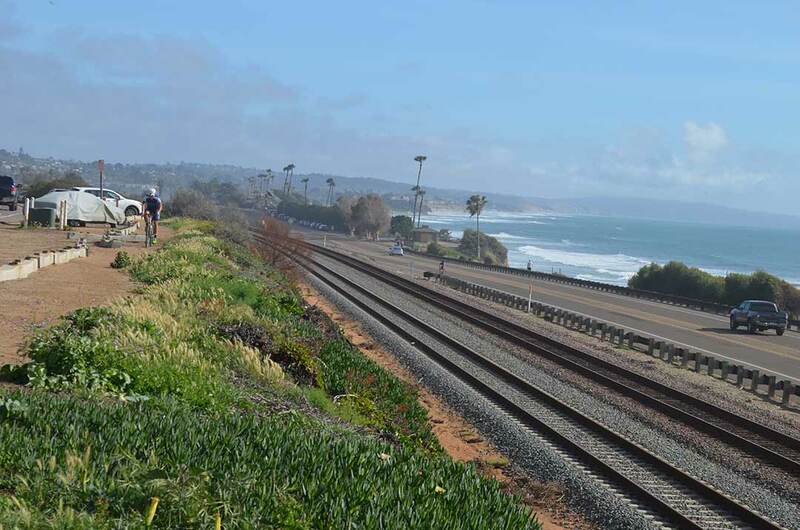 ENCINITAS — The Encinitas City Council voted Wednesday night to discontinue its support of the current alignment of the Coastal Rail Trail through Cardiff-by-the-Sea and endorse a trail alignment along Coast Highway 101. The Council’s 4-1 vote reverses its decision in May 2015, when the body voted 3-2 to have the trail run along the east side of the rail tracks along San Elijo Avenue and an undeveloped section of the coastal plain that is a popular walking and jogging path. Originally, council members Lisa Shaffer, Catherine Blakespear and Tony Kranz supported the San Elijo alignment. But Blakespear requested at the March 16 meeting that the council reconsider its support of the current configuration. On Wednesday night, Shaffer was the only council member to cast a vote opposing the change. The previous decision has come under intense criticism from a large faction of Cardiff residents, who believe the trail is not right for the coastal community. Dozens of those opponents packed the Encinitas City Council chambers Wednesday night in an effort to convince the council to reconsider its support. Those who remained after the four-hour meeting applauded after a projector screen showed the vote. The San Diego Association of Governments, or SANDAG, is the lead agency on the project and has budgeted $5.1 million for the project, which will be paid for through TransNet, the county half-cent sales tax. But Encinitas officials have discretion over the route it takes through the community, and would be responsible for construction and maintenance of the trail section. Opponents said the trail’s construction would foul pristine natural coastal terrain and likely trigger the erection of a fence along the rail corridor in Cardiff that would cut off a popular, albeit illegal, pedestrian crossing area. Officials with the North County Transit District, which owns the rail lines and the adjacent land, said the agency plans on installing fence along the corridor in five to 10 years, but some of the council said they were skeptical given that the transit agency has yet to identify money for the planning. The No Rail Trail group has peppered the inboxes of elected officials and media for months with form letters outlining the group’s reasons for opposing the project. In recent weeks, they have erected signs throughout Cardiff. Wednesday’s meeting included nearly two hours of public testimony from over 30 speakers, most of whom supported moving the proposed trail to Coast Highway 101, as well as individual presentations by Kranz and Shaffer. The city’s public works staff also gave a presentation that outlined the issues around the Cardiff rail corridor, including several projects that are independent of the rail trail that would impact the community. The projects include the imminent construction of a second rail track through the area, which would be accompanied by a 2,000-foot drainage culvert in the undeveloped area adjacent to the tracks. Additionally, crews would have to temporarily close off large swaths of the coastal plain area for construction staging purposes. Among the opponents were several children of the No Rail Trail members. The children said they didn’t want Cardiff to change, with one of the kids telling the council that he hoped his kids would able to play in the natural terrain as he currently does. “I think this entire project should be thrown out,” one of the kids said, eliciting applause from the audience. At one point, the crowd audibly gasped when city staff superimposed the visual rendition of the path onto a picture of the current topography. Several speakers, however, voiced support of the San Elijo configuration, which they said was necessary to fix hazardous pedestrian and biking conditions along the street and believed that the Coast Highway option would imperil recreational cyclists by juxtaposing them with vehicle traffic along the busy road. Other speakers didn’t lodge an opinion on the rail proposal, but criticized the council for the process, which they said had divided the community. They urged the council to step back and come up with a solution that addressed all of the community needs. The motion, made by Mayor Kristin Gaspar, originally also called for the council to suspend work on an at-grade crossing at Montgomery Avenue, which had become another key part of the rail trail debate. The Montgomery Avenue crossing was seen by supporters of the trail as an olive branch to the community, which would lose the illegal access as soon as the North County Transit District erects the fence along the rail corridor. But city engineering staff told the council in February that the crossing at Montgomery Avenue might not qualify for a “quiet zone” designation from the Federal Rail Administration, which means that either train horns or wayside horns would blow in the area, disrupting neighbors and nearby Cardiff Elementary School. If the crossing doesn’t get the designation, then the city would have to potentially consider an underground crossing at the intersection, which would cost $7.5 million to $8 million, according to the estimates. Gaspar said she believed the Montgomery crossing should be looked at as part of a longer-term vision plan for the entire rail corridor in Encinitas from Leucadia to Cardiff. Several of her colleagues, however, said that with a consultant already studying the at-grade crossing, as well as a bridge and underpass at the same location — as required by the California Public Utilities Commission — the city should continue with the process. Gaspar’s motion also included the creation of a group of residents who would work with the city’s rail corridor vision consultant to craft the plan. City officials recently received four proposals from contractors for the rail vision study and will bring the City Council a recommended consultant in coming weeks. Shaffer, who cast the lone dissenting vote, said she did not want the city to forget issues along San Elijo if it voted to change the alignment. Her colleagues assured her that the issues would be addressed independent of the rail trail. She also pushed for the city to expedite a test of wayside horns in the area of Montgomery to see if the horn noise would be acceptable for the nearby residents and school. “We won’t know these things if we don’t study them,” she said.